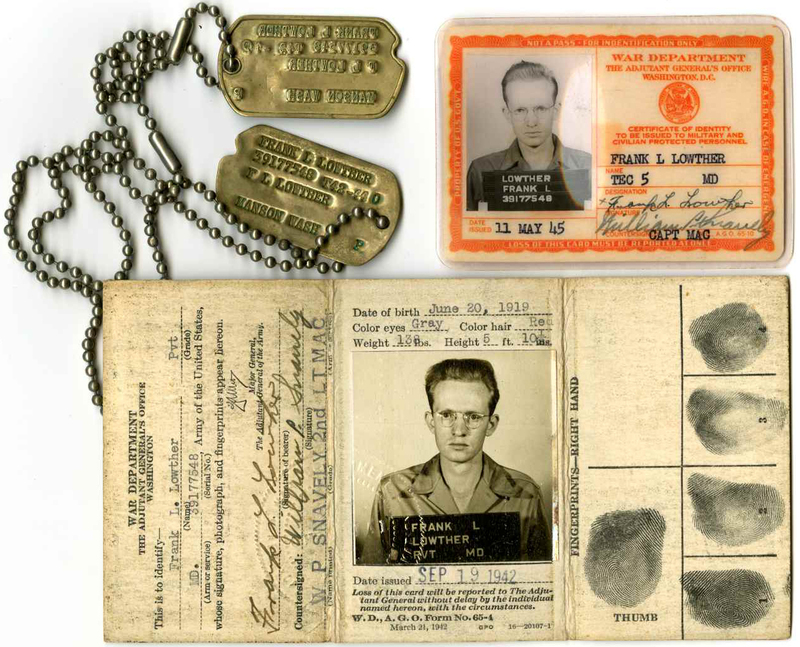 DOG TAGS AND IDENTITY CARDS Private Frank L. Lowther (1919-1998) was an enlisted man with the 8th Evac and traveled with the mobile unit as it trained and then served in North Africa and Italy. He was born in Oregon, but became a resident of Martinsburg, West Virginia, and retired from the Veterans Affairs Medical Center. 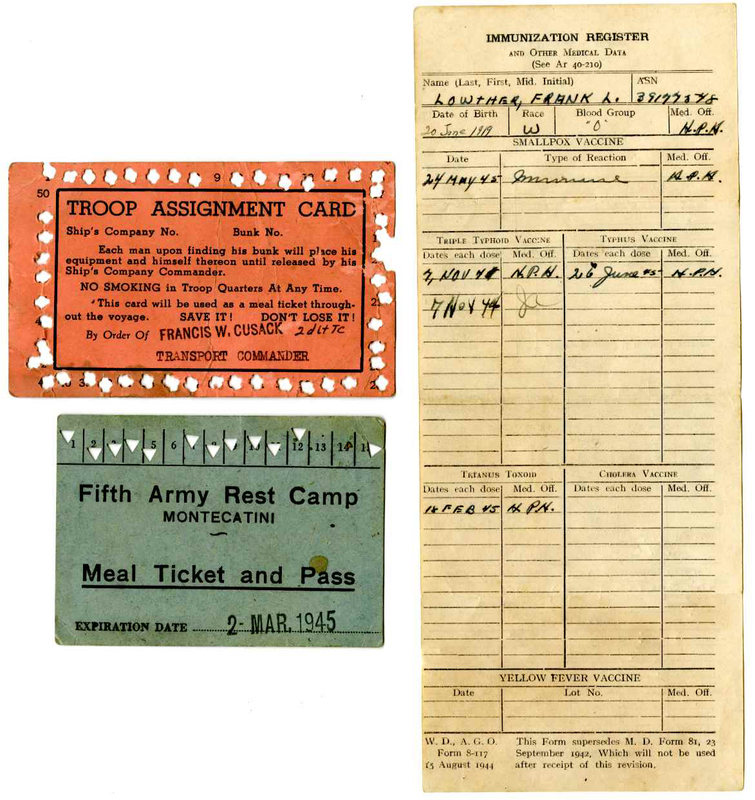 When Lowther returned home from the war, he kept enough mementos of his experiences to make an archivist proud, and it is on these objects that his recollection is based. 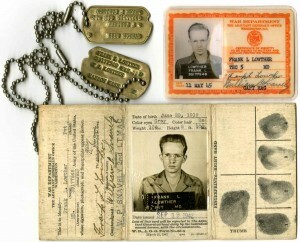 He saved personal items officially issued to him including his dog tags, pay record, and identity cards. From these we know he had gray-blue eyes and red hair, wore glasses, was between five feet nine inches and five feet ten and a half inches tall, weighed 138 pounds going into the service with seven pounds more by the end of the war, and was born on June 20, 1919. 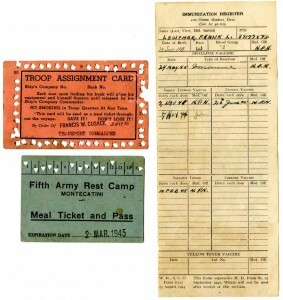 PUNCH CARDS AND IMMUNIZATION RECORD Lowther took good care of his Troop Assignment Card which served as his punch ticket for meals on board his ship (with marks for 48 out of 50 meals). 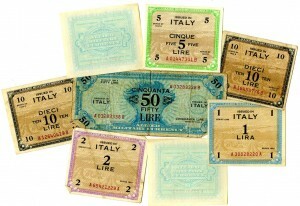 Before the spring offensive that ended the war in 1945, he spent about five days at the Montecatini Rest Camp in Tuscany which would have been a welcome respite from the long winter spent in the Apennine Mountains. He was immunized for smallpox, typhoid, typhus, and tetanus, but not cholera or yellow fever. Those immunizations were important because more patients at the 8th Evacuation Hospital were treated for illness than wounds and injuries combined. In fact, from the opening of the hospital in Casablanca in November 1942 to its closing in Desenzano, Italy, in September 1945, the hospital admitted more than 48,000 patients in these categories: disease–31,064, injury–6,562, and wounded–10,417. 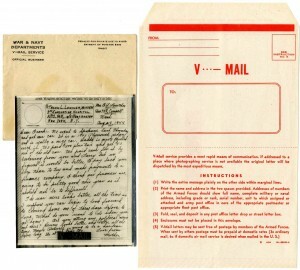 V-MAIL AND LETTERS FROM HOME Private Lowther also brought back unused V-mail forms and letters from family that had gone through the V-mail process. 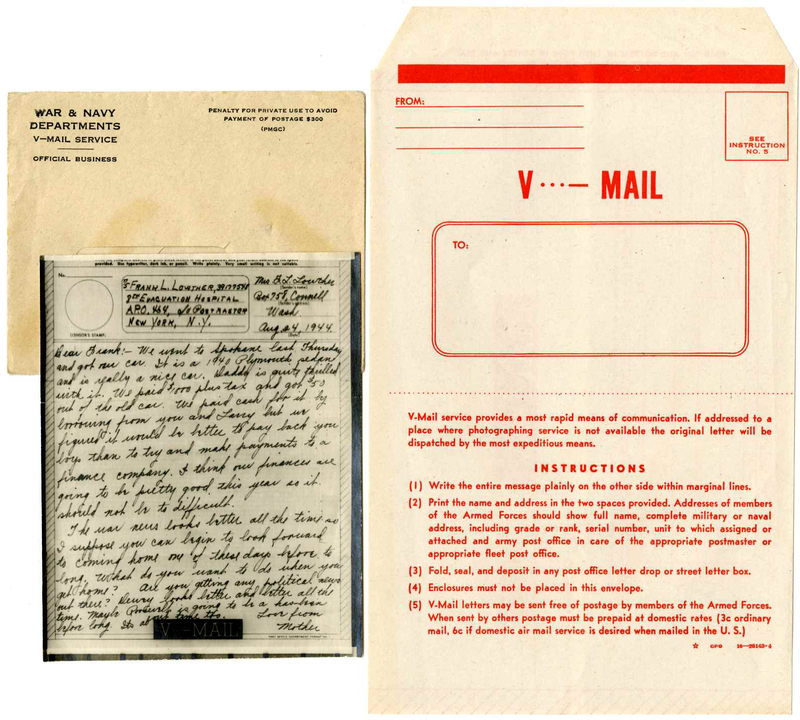 V-mail, short for Victory mail, was the main way soldiers kept in touch with folks back home. 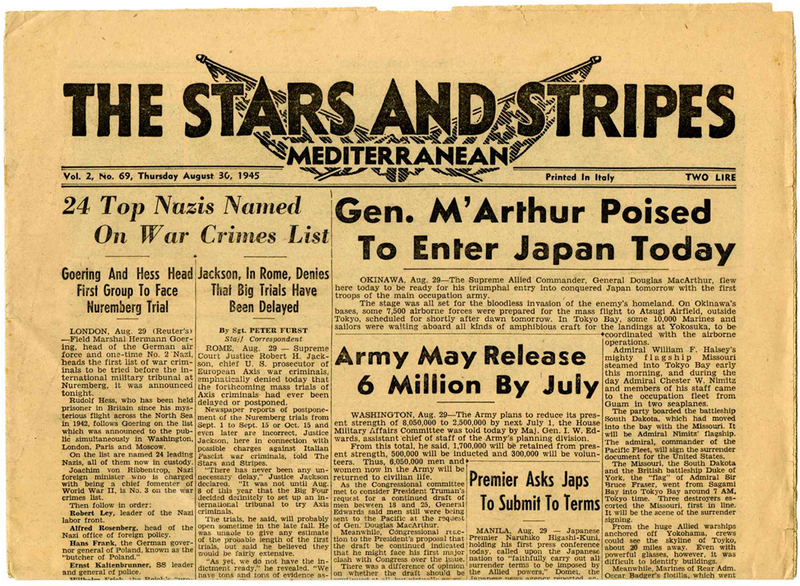 While it seems cumbersome to write a letter and then censor, copy to microfilm, ship, and print it upon arrival, the process saved tons of shipping space for war matériel. One mail sack weighing 45 pounds could carry microfilm representing letters that would fill 37 sacks and weigh 57 times as much. And V-mail had the advantage of foiling espionage communication since invisible ink and microdots would not show up in a photocopy. His mother’s letter let Lowther know that his parents had just bought a Plymouth sedan for $1,000, were hopeful about the war ending, and favored (Thomas E.) Dewey over (Franklin D.) Roosevelt. BIBLE AND SOLDIER’S HANDBOOK Lowther kept at least two books with him for the duration of the war. He had a small New Testament and book of Psalms with an introductory letter by President Franklin D. Roosevelt. This was given to millions of soldiers. 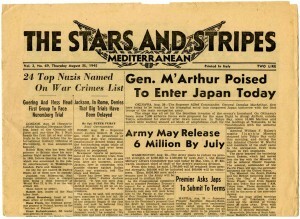 He also held onto his well-worn Basic Field Manual or Soldier’s Handbook which included information on military discipline, arms and equipment, marching, maps, sanitation, first aid, and a host of other subjects. DISINFECTANT Private Lowther brought back a small bottle with little white pills and only a partial label. Some of the words or word fragments on the label are “For the disinfect-“ and “do-benzoicacid.” Made by Abbott Laboratories this container probably holds halazone or p-dichlorosulfonamidobenzoic acid. This tablet was used before and during World War II to disinfect canteen water. UNIFORM Private Lowther saved his military clothing including caps, pants, and shirt. 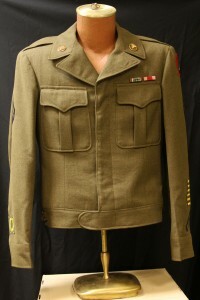 His olive drab “Ike” jacket includes insignia: Technician Fifth Grade and 5th Army patches, six gold stripes each signifying six months of overseas service, Army Meritorious Unit Award patch, European-African-Middle Eastern Campaign ribbon bar with four stars, Good Conduct ribbon, U.S. Army pin, and metal caduceus. During the war, General Dwight “Ike” Eisenhower asked for a comfortable, non-restrictive jacket with a cropped waist. Originally it was designed to be one of several layers of clothing for use in combat. Shortly after it became standard issue in November 1944, the Ike jacket was modified and became part of the dress uniform for the Army. Both the field jacket and the dress jacket had a collar and lapels that could be turned up and buttoned to protect against cold. The jacket had four buttons down the front and two for the pockets, but they were all concealed. This clever design kept equipment or heavy underbrush from catching on a button. Buckles on the waistband made it possible to cinch the jacket tight to keep body heat in and drafts out. ARMBAND One last item in Lowther’s box is a memento that came from another U.S. soldier. It was worn by a paratrooper dropped behind enemy lines and served to identify him as an American so he would not be mistaken for an Axis soldier by invading U.S. assault forces. The off-white armband is made of oilcloth, four inches by 16.5 inches, and has a 48-star U.S. flag printed on it. Holes on both ends allowed it to be attached to a sleeve by safety pins.